On January 4, 2019, Dominique Smith was sentenced to 25 years in prison for robbing someone of a frozen pizza and six dollars at gunpoint, but no one was hurt. The next day, in a separate case, a man who killed his cousin was also sentenced to 25 years. Dominique had no record, not even for minor traffic offenses, and he was only 18 years old when he committed the crime. But Dominique had a greater burden to bear: he was mentally ill.
Courts and the law attempt to override the fact of mental illness, leaving the only out as the plea of not guilty by reason of insanity. This has become increasingly unpopular with the public, and legally requires not just “mental illness” but the proven inability to know that your crime was wrong at the time, a much higher bar. Its use has declined to one-quarter of one percent of all felony cases, or one in 400 cases. The main way that the law recognizes mental illness is in possibility of an “incompetency to stand trial” ruling, which requires a court psychiatrist evaluation and means that the defendant is unable to communicate with his or her attorney in order to make the “informed decision” to plead or stand trial. Across the country, thousands of people are in county jails for extended periods because they are too sick for their cases to proceed. After such a judgement, Smith was sent to Chester Correctional Center, where he was given medication and a program for five months to stabilize his condition until he could be labeled “fit,” at which point he was returned to our County Jail for further court proceedings. Upon his return, and as before, Dominique was held in an isolation cell, where his condition quickly deteriorated. After five weeks, the Court sent him back to Chester, this time for six months of treatment to render him able to talk to his attorney. He returned to the County Jail for the final time on August 29, 2018. Nine hundred and forty-seven days passed between the date of his crime and his sentencing. On Nov. 20, 2018, Smith’s final attorney, Public Defender Lindsey Yanchus, petitioned for a dismissal of his case or a retrial, on the grounds that his original trial in January, 2017 had been held in his absence—he was in a mental ward at Sarah Bush Hospital in Charleston at the time—and he had never authorized his private attorney, Harvey Welsh, to represent him. In the hearing for a retrial, both the prosecuting attorney, Scott Larson, and the judge, Roger Webber, shared their beliefs that Mr. Smith had been malingering from the beginning, and had voluntarily entered a mental hospital to avoid trial. Ms. Yanchus offered for consideration the court psychiatrist’s judgment that Smith was “incompetent.” as well as the voluminous records from the Chester prison. As she was arguing that point, Judge Webber changed the subject to ask Yanchus how she thought a retrial would have given a different outcome, prompting Yanchus to argue that she would have mounted a vigorous defense and made clear Dominique’s state of mind and whereabouts. The judge rejected her argument. Assistant State’s Attorney Larson then played a video of a portion of Smith’s interrogation at the police station just hours after his crime to illustrate what he thought was his rational state of mind. In the video, Dominique talks giddily about how he wanted to “rob somebody with a gun because everybody wanted to do that.” An alternative view of the video was a kid very high on drugs, which he had allegedly taken at a campus party before the robbery. After his original trial in January, 2017, Dominique was charged with another crime on April 18, 2017: aggravated battery against a peace officer—a jail guard. According to two witnesses (a family member and a Courtwatch volunteer who visited him at the jail), Dominique was in a state of agitation and paranoia for weeks. He was hearing voices and refused to eat. During that period, he attacked a guard who entered his isolation cell during mealtime. The charge added another $50,000 to Dominique’s bail and seemed a kind of insult: a criminal charge against a mentally ill person, being housed as a mentally ill person, for attacking someone while experiencing an episode of acute paranoia—a not-uncommon scenario in a mental hospital. However, Larson pursued this charge vigorously on the day of sentencing, calling the guard to the witness stand to testify about his experience. Representing the state, Larson’s consistent position was that Dominique was faking his illness to game the system. Judge Webber had to break with that argument in order to account for the year and a half that Dominique had spent under diagnosis by multiple psychiatrists in two different systems as “incompetent to stand trial.” Judge Webber declared, “after trying to game the system for some time, Mr. Smith had a psychotic break and became incompetent to stand trial,” as he dropped the second charge. The words “psychotic break” were the first reference to an actual mental illness in the entire courtroom saga of Dominique Smith. But of course he had been made “fit to stand trial,” by medication. Since they already had held his trial without him, he was now fit to be sentenced. After great effort and expense, Dominique had been made temporarily competent to stand trial, so that they could throw the book at him. Far from being a mitigating factor, as the public might imagine, mental illness is either ignored or raised as an aggravating factor. Perhaps it should be called “guilty by reason of insanity.” For Dominique Smith that meant a sentence of 25 years—the usual sentence for murder. 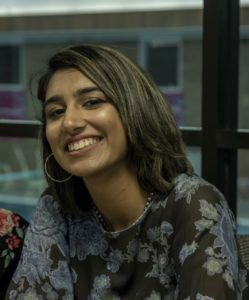 Isra is a junior studying African American studies and urban planning at UIUC, with hopes of attending law school in the future and becoming an advocate for marginalized youth through restorative justice practices. She can be contacted at israfrahman@gmail.com.